This wonderful nursing pillow is handmade with certified organic cotton & natural wool for the purest nursing pillow support there is. Made in the USA, the wool in this product is sourced in the Pacific Northwest of the United States from farmers who participate in the Sustainable Wool Program, producing high quality ultra clean wool from sheep flocks that are managed in a humane ethical way and in a chemical-free thoughtful environment. Wool is a natural dust mite repellent, so these pillows are great for moms and babies, alike, for protection against dustmites. The wool fill is contained within sturdy, certified organic cotton in a natural ivory color. 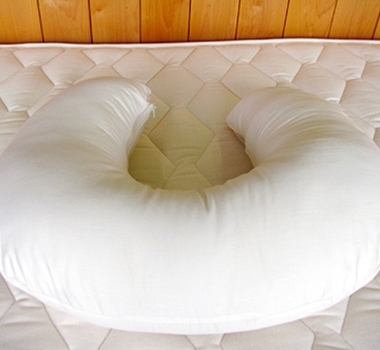 A favorite among nursing mothers & babies, the U-Shaped pillow measures 19"x23." The pillow helps to lift your baby closer to your breast and relieves pressure off of your arm and legs when trying to hold the baby up. When your baby gets older, the pillow can be useful as a prop to sit your baby up. Matching certified organic cotton pillow cover recommended and sold separately. Clean only according to instructions provided.